Chelation (pronounced /kiːˈleɪʃən/) is a type of bonding of ions and molecules to metal ions. It involves the formation or presence of two or more separate coordinate bonds between a polydentate (multiple bonded) ligand and a single central atom. Usually these ligands are organic compounds, and are called chelants, chelators, chelating agents, or sequestering agents. Chelation is useful in applications such as providing nutritional supplements, in chelation therapy to remove toxic metals from the body, as contrast agents in MRI scanning, in manufacturing using homogeneous catalysts, and in fertilizers. Ethylenediamine ligand chelating to a metal with two bonds. Cu2+ complexes with nonchelating methylamine (left) and chelating ethylenediamine (right) ligands. Consider the two equilibria, in aqueous solution, between the copper(II) ion, Cu2+ and ethylenediamine (en) on the one hand and methylamine, MeNH2 on the other. In (1) the bidentate ligand ethylenediamine forms a chelate complex with the copper ion. Chelation results in the formation of a five-membered CuC2N2 ring. 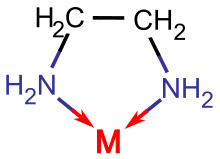 In (2) the bidentate ligand is replaced by two monodentate methylamine ligands of approximately the same donor power, meaning that the enthalpy of formation of Cu—N bonds is approximately the same in the two reactions. where R is the gas constant and T is the temperature in Kelvin. is the standard enthalpy change of the reaction and is the standard entropy change. Since the enthalpy should be approximately the same for the two reactions, the difference between the two stability constants is due to the effects of entropy. In equation (1) there are two particles on the left and one on the right, whereas in equation (2) there are three particles on the left and one on the right. This difference means that less entropy of disorder is lost when the chelate complex is formed than when the complex with monodentate ligands is formed. This is one of the factors contributing to the entropy difference. Other factors include solvation changes and ring formation. Some experimental data to illustrate the effect are shown in the following table. These data confirm that the enthalpy changes are approximately equal for the two reactions and that the main reason for the greater stability of the chelate complex is the entropy term, which is much less unfavourable. In general it is difficult to account precisely for thermodynamic values in terms of changes in solution at the molecular level, but it is clear that the chelate effect is predominantly an effect of entropy. In earth science, hot chemical weathering is attributed to organic chelating agents (e.g., peptides and sugars) that extract metal ions from minerals and rocks. Some metal complexes in the environment and in nature are not found in some form of chelate ring (e.g., with a humic acid or a protein). Thus, metal chelates are relevant to the mobilization of metals in the soil, the uptake and the accumulation of metals into plants and microorganisms. Selective chelation of heavy metals is relevant to bioremediation (e.g., removal of 137Cs from radioactive waste). Chelation therapy is the use of chelating agents to detoxify a patient's body of poisonous metal agents, such as mercury, arsenic, and lead, by converting them to a chemically inert form that can be excreted without further interaction with the body. Chelation using calcium disodium EDTA has been approved by the U.S. Food and Drug Administration (FDA), but only for serious cases of lead poisoning. It is not approved for treating "heavy metal toxicity". Although they can be beneficial in cases of serious lead poisoning, use of unapproved chelating agents is dangerous. Use of disodium EDTA (edetate disodium) instead of calcium disodium EDTA has resulted in fatalities due to hypocalcemia. Disodium EDTA is not approved by the FDA for any use, and all FDA-approved chelation therapy products require a prescription. Chelate complexes of gadolinium are often used as contrast agents in MRI scans. Auranofin, a chelate complex of gold, is used in the treatment of rheumatoid arthritis. Chelation in the intestinal tract is a cause of numerous interactions between drugs and metal ions (also known as "minerals" in nutrition). As examples, antibiotic drugs of the tetracycline and quinolone families are chelators of Fe2+, Ca2+ and Mg2+ ions. EDTA, which binds to and sequesters calcium, is used to alleviate the hypercalcimia that often results from band keratopathy. The calcium may then be scraped from the cornea with a spatula-shaped instrument, allowing for some increase in clarity of vision for the patient. This procedure requires the use of numbing drops, as the acid, though weak from a pH standpoint, would cause acute ocular discomfiture. Patients normally wear an eye shield following such procedures and are advised against swimming for some weeks afterwards. This is normally an outpatient procedure, requiring no general anesthetics to be employed prior to performing the procedure. Homogeneous catalysts are often chelated complexes. A typical example is the ruthenium(II) chloride chelated with BINAP (a bidentate phosphine) used in e.g. Noyori asymmetric hydrogenation and asymmetric isomerization. The latter has the practical use of manufacture of synthetic (–)-menthol.Uses of Chelates. Citric acid is used to soften water in soaps and laundry detergents. A common synthetic chelator is EDTA. Phosphonates are also well-known chelating agents. Chelators are used in water treatment programs and specifically in steam engineering, e.g., boiler water treatment system: Chelant Water Treatment system. ↑ Latin chela, from Greek, denotes a claw. ↑ Greenwood, Norman N.; Earnshaw, Alan (1997). Chemistry of the Elements (2nd ed.). Butterworth-Heinemann. p. 910. ISBN 0-08-037941-9. ↑ Schwarzenbach, G. (1952). "Der Chelateffekt". Helvetica Chimica Acta. 35 (7): 2344–59. doi:10.1002/hlca.19520350721. ↑ Krämer, Ute; Cotter-Howells, Janet D.; Charnock, John M.; Baker, Alan J. M.; Smith, J. Andrew C. (1996). "Free histidine as a metal chelator in plants that accumulate nickel". Nature. 379 (6566): 635–8. Bibcode:1996Natur.379..635K. doi:10.1038/379635a0. ↑ Magalhaes, J. V. (2006). "Aluminum tolerance genes are conserved between monocots and dicots". Proceedings of the National Academy of Sciences of the United States of America. 103 (26): 9749–50. Bibcode:2006PNAS..103.9749M. doi:10.1073/pnas.0603957103. PMC 1502523 . PMID 16785425. ↑ Ha, Suk-Bong; Smith, Aaron P.; Howden, Ross; Dietrich, Wendy M.; Bugg, Sarah; O'Connell, Matthew J.; Goldsbrough, Peter B.; Cobbett, Christopher S. (1999). "Phytochelatin Synthase Genes from Arabidopsis and the Yeast Schizosaccharomyces pombe". The Plant Cell. 11 (6): 1153–64. doi:10.1105/tpc.11.6.1153. PMC 144235 . PMID 10368185. ↑ Das, Saurabh; Miller, Dusty R.; Kaufman, Yair; Martinez Rodriguez, Nadine R.; Pallaoro, Alessia; Harrington, Matthew J.; Gylys, Maryte; Israelachvili, Jacob N.; Waite, J. Herbert (2015). "Tough Coating Proteins: Subtle Sequence Variation Modulates Cohesion". Biomacromolecules. 16 (3): 1002–8. doi:10.1021/bm501893y. PMC 4514026 . PMID 25692318. ↑ Harrington, M. J.; Masic, A.; Holten-Andersen, N.; Waite, J. H.; Fratzl, P. (2010). "Iron-Clad Fibers: A Metal-Based Biological Strategy for Hard Flexible Coatings". Science. 328 (5975): 216–20. Bibcode:2010Sci...328..216H. doi:10.1126/science.1181044. PMC 3087814 . PMID 20203014. ↑ Das, Saurabh; Rodriguez, Nadine R. Martinez; Wei, Wei; Waite, J. Herbert; Israelachvili, Jacob N. (2015). "Peptide Length and Dopa Determine Iron-Mediated Cohesion of Mussel Foot Proteins". Advanced Functional Materials. 25 (36): 5840–7. doi:10.1002/adfm.201502256. ↑ Albion Laboratories, Inc. "Albion Ferrochel Website". Retrieved July 12, 2011. 1 2 "FDA Issues Chelation Therapy Warning". September 26, 2008. Retrieved May 14, 2016. ↑ Centers for Disease Control Prevention (CDC) (2006). "Deaths associated with hypocalcemia from chelation therapy--Texas, Pennsylvania, and Oregon, 2003-2005". Morbidity and Mortality Weekly Report. 55 (8): 204–7. PMID 16511441. ↑ "Questions and Answers on Unapproved Chelation Products". FDA. February 2, 2016. Retrieved May 14, 2016. ↑ Campbell, NR; Hasinoff, BB (1991). "Iron supplements: a common cause of drug interactions". British Journal of Clinical Pharmacology. 31 (3): 251–5. doi:10.1111/j.1365-2125.1991.tb05525.x. PMC 1368348 . PMID 2054263. ↑ Lomaestro BM, Bailie GR (1995). "Absorption interactions with fluoroquinolones. 1995 update". Drug Safety. 12 (5): 314–33. doi:10.2165/00002018-199512050-00004. PMID 7669261. ↑ Willingham, Emily (2012). "No Evidence Supporting Chelation As Autism Treatment". Forbes. Retrieved October 4, 2014. ↑ Brownstein, Joseph (2010). "Father Sues Doctors Over 'Fraudulent' Autism Therapy". ABC News. Retrieved October 4, 2014. ↑ Doja, Asif; Roberts, Wendy (2006). "Immunizations and Autism: A Review of the Literature". The Canadian Journal of Neurological Sciences. 33 (4): 341–6. doi:10.1017/S031716710000528X. PMID 17168158. ↑ Hart, J. Roger (2011). "Ethylenediaminetetraacetic Acid and Related Chelating Agents". Ullmann's Encyclopedia of Industrial Chemistry. doi:10.1002/14356007.a10_095.pub2. ↑ Morgan, Gilbert T.; Drew, Harry Dugald Keith (1920). "CLXII.—Researches on residual affinity and co-ordination. Part II. Acetylacetones of selenium and tellurium". Journal of the Chemical Society, Transactions. 117: 1456–65. doi:10.1039/ct9201701456.